I have been off hard drugs for a whole 8 hours. I have been to target and the grocery store. I even went on Taylor’s field trip this morning, but that was a bit of a stretch; I was completely exhausted at the end! I still get sore when I overdo it – which I keep doing. I also get REALLY tired when I overdo it. I can pick Caleb up, but if I do it too many times, I can feel it! And I got a picture of my cyst…do not continue if you are squeamish. 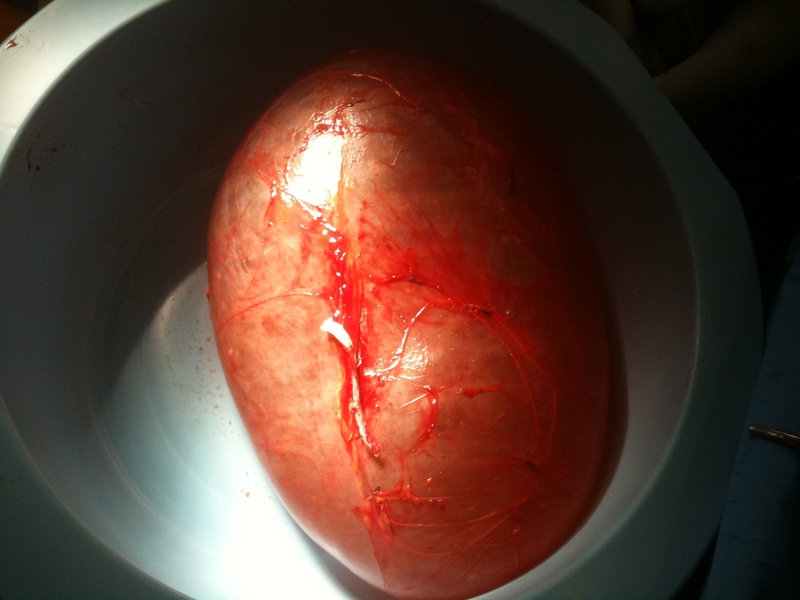 The surgeon likened it to a big jelly bean…don’t think I’ll ever be able to look at jelly beans the same way again. I still can’t believe that thing was inside of me! Crazy stuff. THAT IS INSANE!!!!!!!!! did they ever say how long they thought it took for it to grow that size? months? years? they don’t know for sure, but they think it was very slow growing, so probably at least a few years!